This week has been hot! I've eaten my way through two boxes of cornettos and covered Zach in factor 50 for just a short stroll to the shops. We've spent most of the week inside hiding from the harsh rays because pale ginger babies and the sun definitely do not go hand in hand! Our house is really old and has very thick walls which luckily means it's stayed pretty cool in the heat, thank goodness! 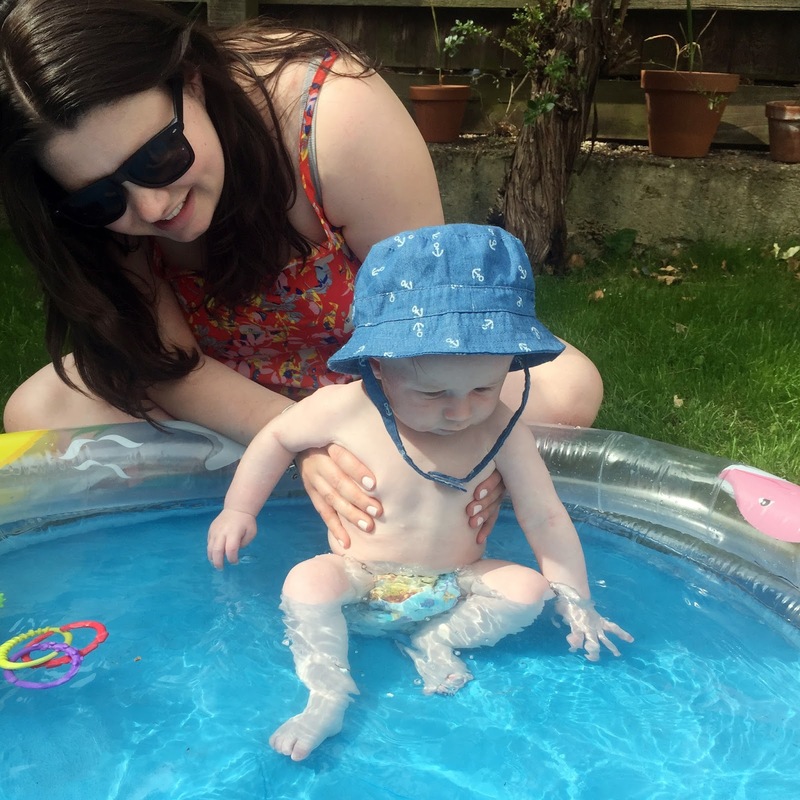 By Friday though I was starting to get cabin fever, and although still very warm the heat seemed to have subsided a little bit which meant one thing... Time to get the paddling pool out! 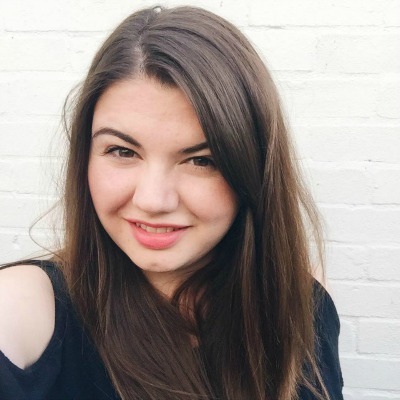 I have so many memories from splashing around in paddling pools as a child. I was best friends with my next door neighbours and it felt like we spent every day of the 6 week summer holidays in our swimwear. We even used to put bubble bath in to create our own little 'spa' in the garden! I always look back on those days with such fond memories, we were so young and carefree. Life was so much simpler. When we moved into this house our garden was overgrown and there was not even a blade of grass let alone a lawn. But after a lot of digging and sewing seeds (Jono, not me) we have finally got the lawn we were after. A space for Zach to play in our small garden, although we know he'll enjoy it more next year than this one! I found a paddling pool after thinking they would all be sold out and on Friday we got it out for the first time. We filled it up in the morning and left it in the sun all day to warm up. The smell of the pool was so nostalgic - warm cheap plastic and water may not sound like it smells heavenly, but it did! We put Zach in the pool in the afternoon once the temperature had cooled a little and the sun wasn't shining directly down on us. He wore a swim nappy (do they not work for anyone else or is it just me? ), lots and lots of suncream, a sun hat and nothing else. He wasn't quite sure what was going on and pulled his usual confused face. The one he did when we took him swimming, that says "I'm not quite sure what's going on right now". My friend Clare and I had to hold him the whole time because he can't yet sit up by himself although he's getting there. 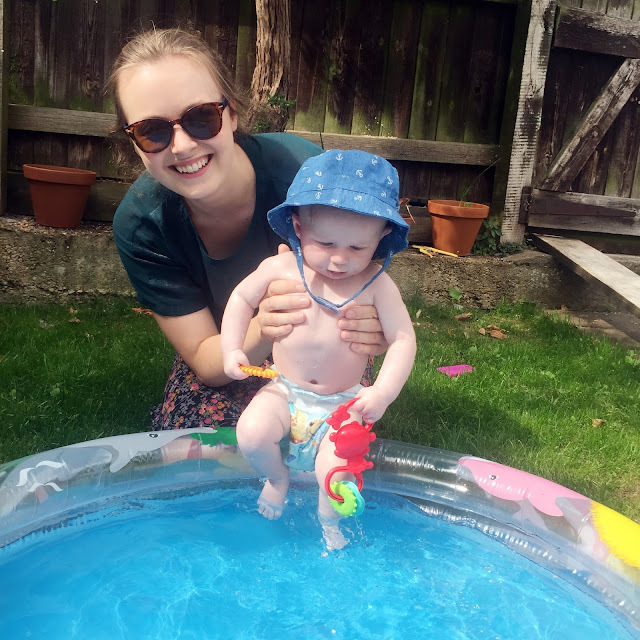 He was such a wriggle bum, but it was so lovely to see him splashing around in the water. 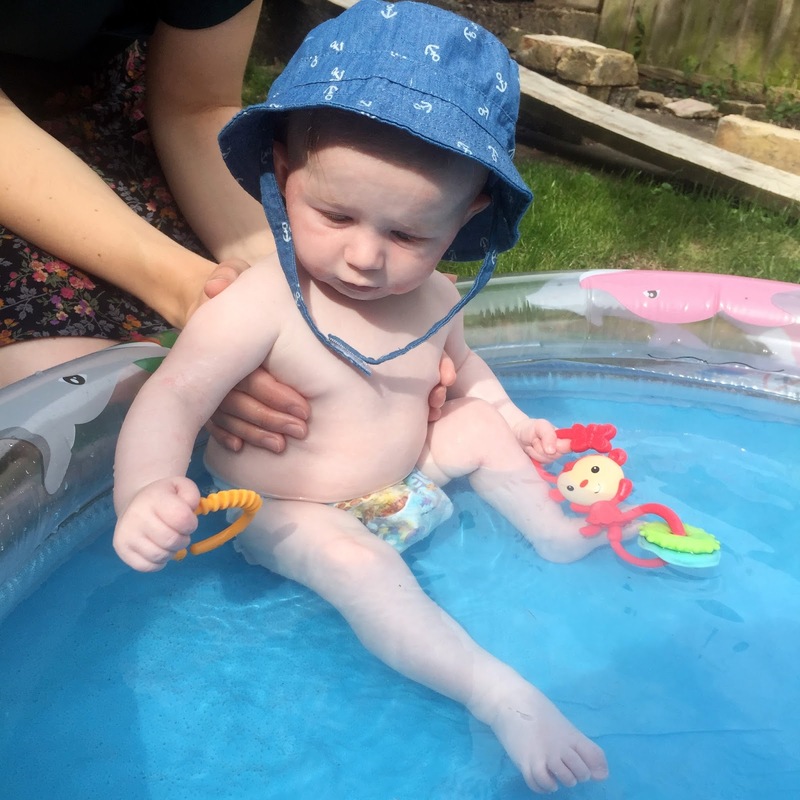 I'm sure by the end of the summer when it's still warm enough to get into the pool he will be sitting up, playing with his toys and no doubt soaking us! 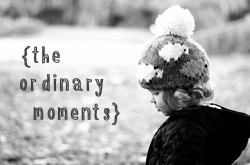 Linking up with Katie from Mummy Daddy Me for the Ordinary Moments. Aww he does look like he's starting to figure it out, what a lovely first for him and definitely the way to go the heat we've had recently!